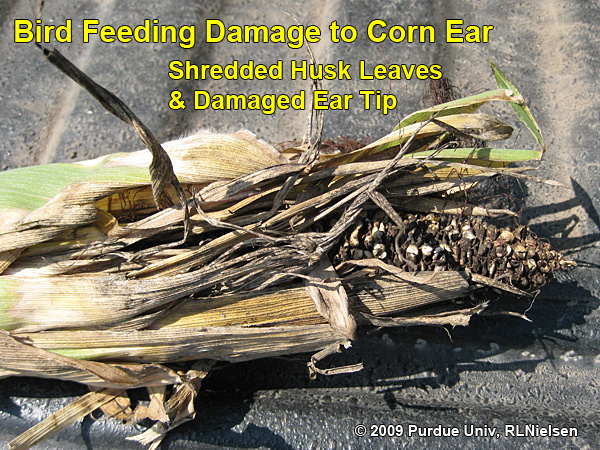 Blackbirds, grackles, and crows often feed on developing ears in corn fields following pollination early in the grain filling period. They seem particularly attracted to developing kernels near the so-called milk stage or "roasting ear" stage. Large flocks of these birds can cause a tremendous amount of damage and will often target one hybrid over another. Damage is often most prevalent along field edges and nearby wooded areas, but can extend throughout a large field. 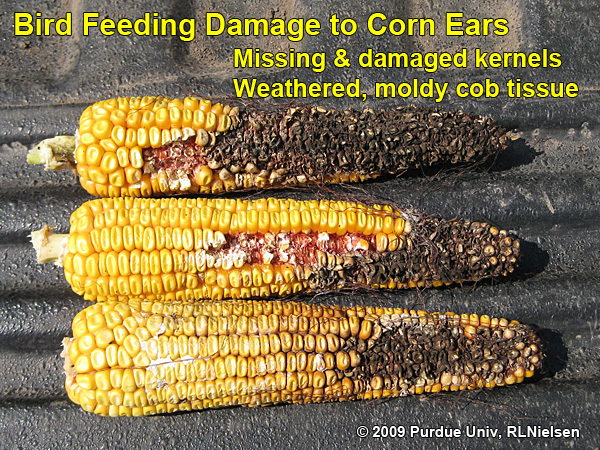 The symptoms that immediately catch the eye are the missing or damaged kernels on the cobs. 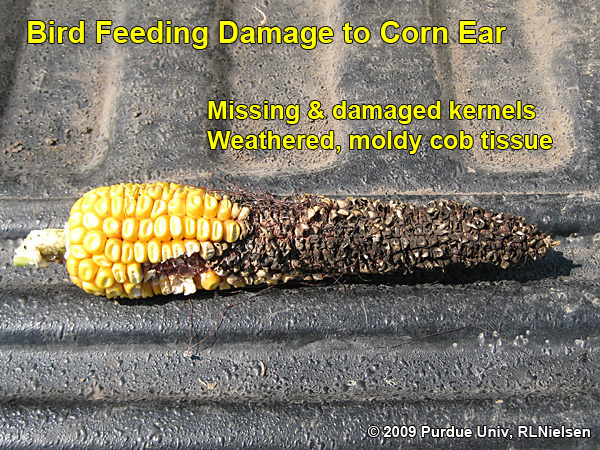 Damaged cobs often turn brown or black once molds begin infecting the damaged tissue. The evidence that clearly identifies birds as the culprits are the shredded husk leaves that result from the birds working their way to the kernels. It is not uncommon for birds to be attracted to only one of several hybrids in a field or to one field over another adjacent one. The reasons for this are not clear, but probably related to slight differences in kernel maturity or other kernel characteristics between hybrids. Bollinger and Caslick (1985) indicated that kernel maturity (as measured by date of silking) was the most important factor in determining the level of blackbird damage to corn. The second most important factor was the peak population level of corn rootworm beetles. 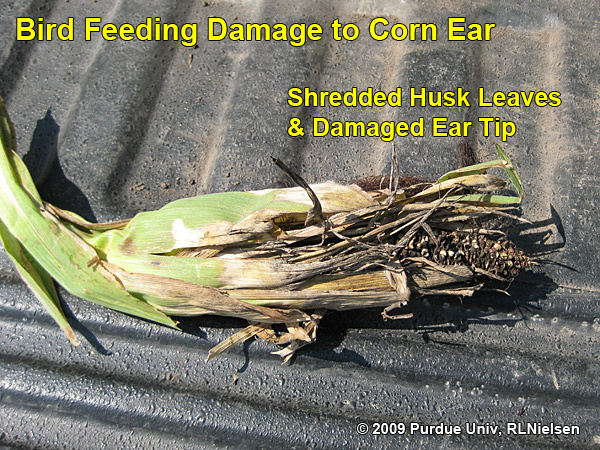 Within a field, the degree to which the husk leaves extended beyond the tip of the ears was strongly correlated with the severity of damage. In an earlier paper, the same two authors (1984) indicated that as little as an average 10% ear damage throughout a field was associated with an estimated 5,000 birds. 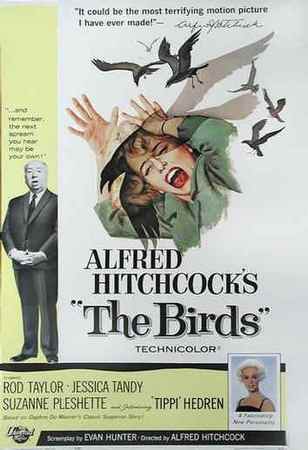 The thought of so many birds in one field brings back bad childhood memories of watching Alfred Hitchcock's classic 1963 horror movie "The Birds"! 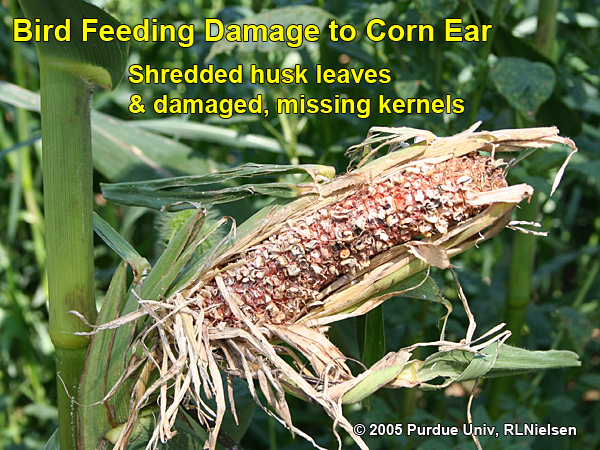 Such bird feeding damage predisposes the ears to the development of various ear molds and rots, some of which may subsequently lead to the development of dangerous mycotoxins (Voight, 2008; Woloshuk, 2001). If you are concerned about the potential for mycotoxins from moldy grain on bird-damaged ears, you can send grain samples to Purdue's Animal Disease Diagnostic Laboratory (ADDL) for a mycotoxin screen. The submission form can be downloaded from the ADDL Web site at http://www.addl.purdue.edu/Submit/Forms.htm. Call the ADDL at 765-494-7440 for details on sample submission and cost for the screening. Bollinger, Eric and James Caslick. 1984. Relationships between Bird-Dropping Counts, Corn Damage, and Red-Winged Blackbird Activity in Field Corn. J. Wildlife Mgmt 48(1):209-211. Bollinger, Eric and James Caslick. 1985. 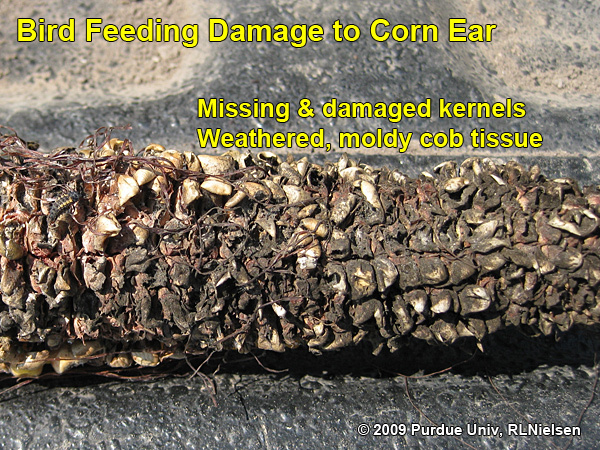 Factors Influencing Blackbird Damage to Field Corn. J. Wildlife Mgmt 49(4):1109-1115. Voight, Del. 2008. Corn Ear Molds. Penn State Field Crop News, Pennsylvania State Univ. [online] http://fcn.agronomy.psu.edu/2008/fcn0831.cfm#e [URL accessed Sep 2009]. Woloshuk, Charles. 2001. Mycotoxins and Mycotoxin Test Kits. Purdue Univ. Extension Publ. BP-47. [online] http://www.extension.purdue.edu/extmedia/BP/BP-47.html [URL accessed Sep 2009]. © 2009 , Purdue University, an equal access, equal opportunity university. This material may be available in alternative formats. If you have trouble accessing this page because of a disability, please contact RLNielsen at rnielsen@purdue.edu.